Please consult the laboratory before sending wood samples that have been conserved. Pretreatment – It is important to understand the pretreatment applied to samples since they directly affect the final result. You are welcome to contact us to discuss the pretreatment or request that we contact you after the pretreatment (and prior to dating). Charges for solvent extraction and cellulose extraction pretreatments are incurred even if radiocarbon analyses are cancelled due to the high cost to the laboratory in time and resources. Waterlogged Samples – You may send waterlogged wood samples for radiocarbon dating. Please take note that the water weight may be as much as 50%-75% depending on the degree of saturation. As such, to be on the safe side, we recommend that you send double or triple the amount we recommend for dry samples (e.g. instead of sending 50 mg dry wood, please send 100-150 mg of waterlogged wood for AMS dating). Please consult the lab if you have insufficient amount of sample. When sending waterlogged samples, please place the wood into a Ziplock bag (no additional water should be sent). Roll or squeeze the bag to remove as much excess air as possible, then seal and ship the bag to our lab for analysis. Collecting wood samples from materials that have been conserved can be complex. An example of such a material is timber from ships. 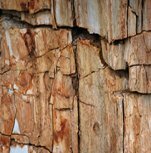 It is best to collect samples in areas that DO NOT show checking or cracking as the additives used for the original shipbuilding like creosote (used to inhibit barnacle or wood worms) could cause the timber’s age to be too old. 1 – Select an area that does not show signs of rot or insect activity. Also make sure that the area does not show signs of being treated with shellac, oil, glue, and other preservatives or additives. 2 – Ideally the wood should be collected from the outermost section of the piece to ensure that the outermost growth rings are dated and results will provide the approximate time of death of the tree as close as physically possible (the inferred age of manufacture). 3 – Obtain two (2) new wood twist-drill bits. Recommended approximate sizes are 5/32″ for the first drilling and 1/8″ for the second drilling. Clean these drill bits before using. Use acetone to remove any machine oils and then air dry. Alternatively, you can clean the drill bits by flaming in a propane/air torch until red hot then allowing to cool in air. 4 – Drill a ~ 5/32″ inch hole approximately 1/4″ to 3/8″ deep and discard the drill shaving. It may be necessary to drill deeper if the wood is rotted or altered. Try to get to the wood that has been isolated from any sort of surface contamination. 5 – Lay the object on its side and place a piece of aluminum foil under the area to be drilled. Using a store-bought 4″ x 4″ aluminum foil is fine and requires no pre-cleaning. 6 – Drill the second hole with the ~ 1/8″ drill bit into the center of the ~ 5/32″ pilot hole and allow the shavings to collect onto the aluminum foil. It is usually best to use a lower speed drill for the second drilling operation so as not to powder the wood. It is best to have shavings rather than sawdust. Collect about 100-200 milligrams of wood shavings. Depending on the density of the wood, this is roughly the amount of wood shavings that would fill the eraser on the end of a #2 pencil or an amount roughly equal to one-fourth of a toothpick. 7 – Once the shavings are collected onto the aluminum foil, fold the foil such that you make a small pouch. Label the pouch using an indelible ink marker (Sharpie) with an identifying name or sample code number that you would like to appear on the results report. Place this aluminum foil pouch into a Ziplock bag before sending to the lab. Label the bag with the same name or code number. 8 – When submitting samples to the lab, we recommend a courier service such as FedEx, UPS, DHL, TNT (etc.) that allows shipment tracking. However, feel free to use the shipping option most convenient for you. Please email the courier service and tracking number to lab@radiocarbon.com if you want us to monitor the delivery of your samples to our lab or to any of our shipping facilities (addresses found here).